Nick Foles almost effortlessly fired off several passes warming up at the beginning of Eagles practice Tuesday at Lincoln Financial Field. Foles is the 6-foot-6 guy wearing the red No. 9 jersey. Note the mechanics ... high release, firm wrist action, head up. Also in the video is Michael Vick (red No. 7). 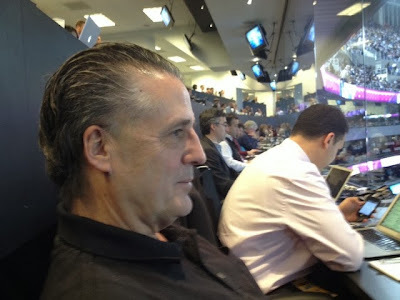 Jack McCaffery will be at the Linc Saturday night. Will youse? Tickets to the Eagles Wild Card game Saturday night against the Saints at Lincoln Financial Field go on sale Tuesday at noon. Log on to www.ticketmaster.com or call 1-800-745-3000. There is a limit of four tickets per household. Knee is feeling less than 100 percent. 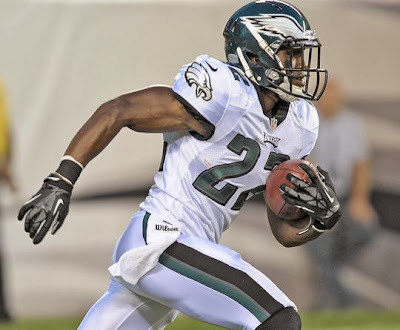 The Eagles will attempt to clinch the NFC East title without safety Earl Wolff. Wolff will sit out his fifth game in the last six played by the Eagles due to a knee issue. Veteran Patrick Chung has been starting at safety for the Eagles. Look for him to rotate with veteran Kurt Coleman. 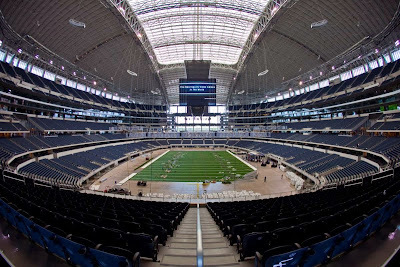 Eagles and Cowboys warm up at AT&T Stadium. The Eagles also scratched quarterback Matt Barkley, safety Colt Anderson (knee), running back Matthew Tucker, cornerback Curtis Marsh, center Julian Vandervelde and offensive tackle Dennis Kelly. Rookie offensive lineman Matt Tobin was active for the second game. 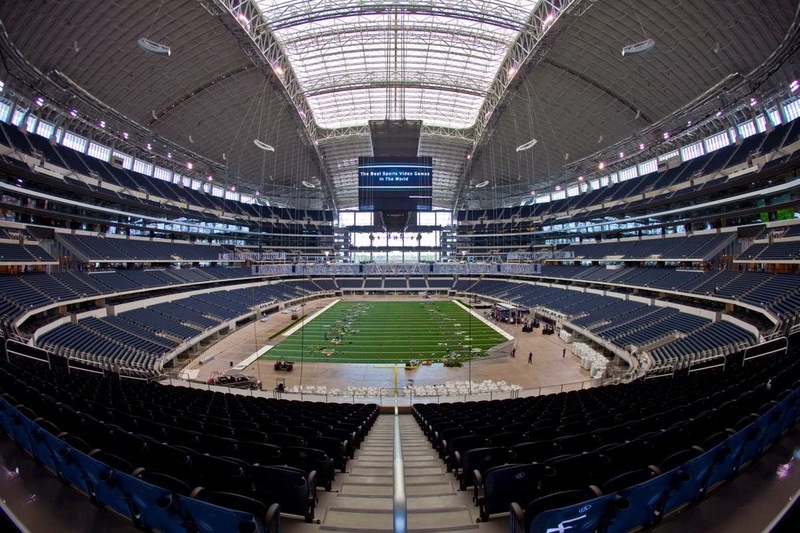 The Cowboys scratched quarterback Tony Romo, linebacker Ernie Sims, cornerback B.W. Webb, safety Jakar Hamilton, offensive tackle Darrion Weems and defensive end Martez Wilson. Allow me to get ahead of the actual conflict and say the Cowboys better not use the absence of Tony Romo as an excuse if they lose to the Eagles tonight. You play with who you have. And if we're to believe Cowboys owner Jerry Jones, Romo replacement Kyle Orton is the finest backup quarterback $10 million can buy. Jones also said Orton was paid all of that money just for these types of situations. Trust me, the Dallas media is going to have a field day with those words if Orton struggles. And in all seriousness, how can he not struggle? The guy isn't that good to begin with. When Eagles defensive coordinator Bill Davis said Orton had won a lot of NFL games he conveniently didn't mention how Orton had lost almost as many games. That's what a backup caliber player does. With Romo out, I owe Merrill Reese a sandwich. Don't even think about detracting from what the Eagles are on the verge of. "They’re not tarnishing nothing," cornerback Cary Williams said. "We’re here to win a Super Bowl. We’re here to build on what we’ve built already. We’re on a mission and they’re in our way ... Period." 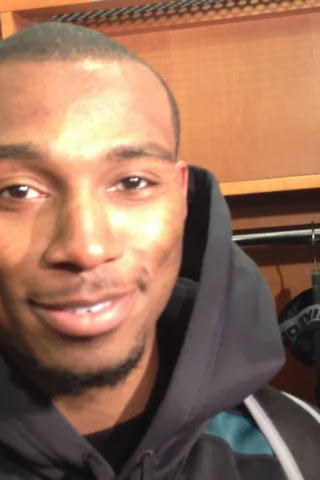 Eagles interception leader Boykin probable. CB Brandon Boykin (hip), LB Trent Cole (hand), S Kurt Coleman (hamstring), OT Lane Johnson (back), LB Mychal Kendricks (knee), G Evan Mathis (illness). The drama surrounding Tony Romo's back injury continues to simmer. Romo underwent an epidural injection presumably to diminish the swelling and pain in his ailing back per this report. 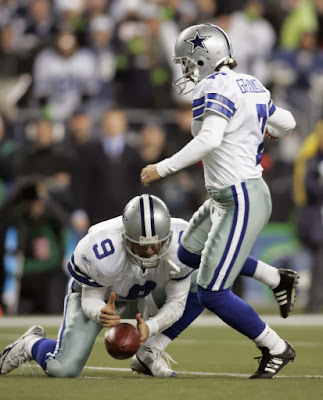 Meanwhile the Cowboys are getting veteran Kyle Orton ready to play the Eagles in the NFC East title showdown Sunday night at AT&T Stadium. Flexing the game from early afternoon to evening obviously has lost part of its luster with the status of Romo in doubt. Orton versus Nick Foles doesn't have much curb appeal. Outside media area at NovaCare. Recyled "This is Philly" quote from @MichelleTafoya. Brandon Boykin got a Pick 6. 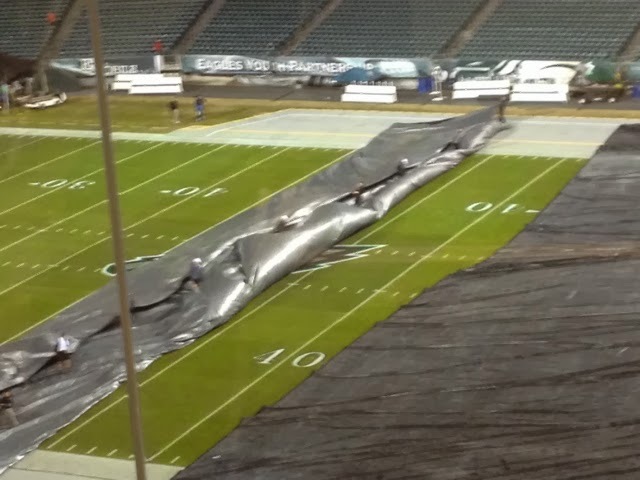 Peeling back tarp at the Linc. 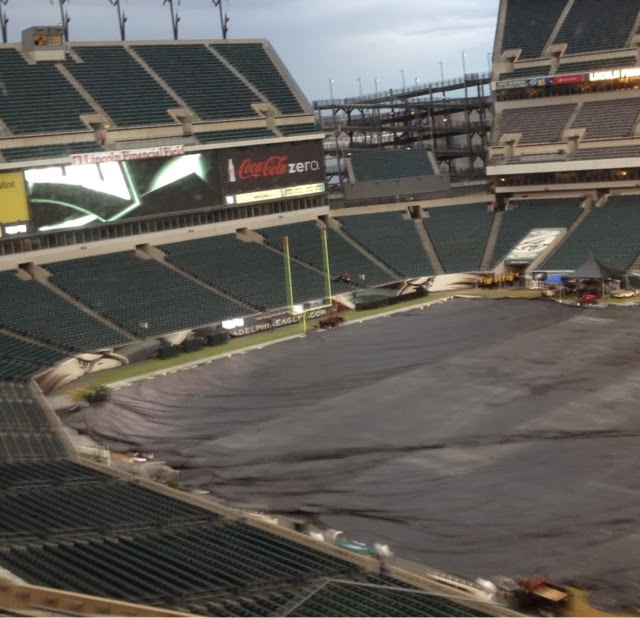 The Linc moments after Cowboys beat Redskins. "We're from Philadelphia ... and we fight." Foles demonstrates how to properly seal the edge. Eagles quarterback Nick Foles was fined $10,000 for a low block on Vikings linebacker Erin Henderson of the Vikings last Sunday. Foles also was penalized 15 yards for the blow that nullified an 18-yard touchdown by DeSean Jackson on a double reverse. The Eagles had a fourth-and-one. But safety Patrick Chung escaped a tackle of Matt Asiata while the Vikings running back was out of bounds. Chung also grabbed hold of the top of Asiata's pads in what looked like a horse collar tackle. Chung was flagged for unsportsmanlike conduct. Eagles safety Earl Wolff practiced and is ready to get back on the field. 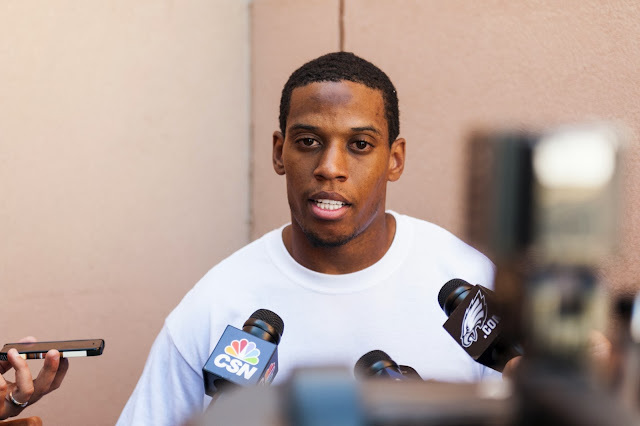 Eagles head coach Chip Kelly isn't totally on board with outspoken cornerback Cary Williams. 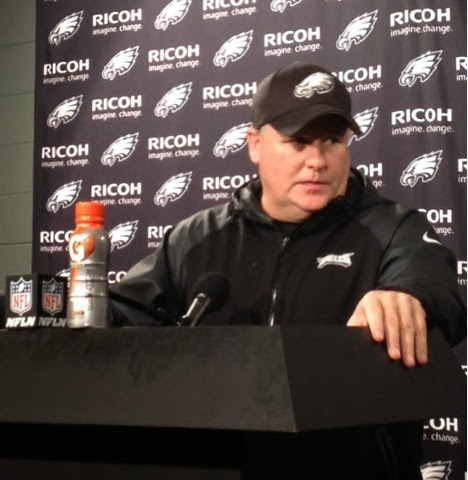 Speaking of the Eagles' 48-30 defeat at the hands of the Vikings last Sunday, Williams said "It was good that they knocked us off" because the setback "helped humble us." "I don't think any loss is good," Kelly said. "But I think every situation you're in you can learn from it. You've got to learn from all of your experiences and get ready for the next game." The Eagles were heavy favorites when they rolled into Minneapolis with a five-game win streak. They were outscored 21-8 in the all-important fourth quarter. While Kelly didn't itemize what he and his team learned, at the top of his list was composure. "What do we do in critical situations?" Kelly said. "We didn't keep our poise very well in the fourth quarter. There's a lot of things you can learn." Eagles cornerback Cary Willliams vowed he wouldn't change the emotional style that's made him the player he is today. It's also obvious Williams isn't going to back down from the direct and brutally honest fashion in which he answers questions. Williams conceded the 48-30 loss to the Vikings was a wake-up call for an Eagles team that was a solid favorite and had won five straight games. Heck, the Vikings competed without ace running back Adrian Peterson, who was hurt. But Williams' teammates aren't going to back him publicly for saying the setback "definitely knocked us off our high horse. "We thought we were good," Williams said. "We thought we were going to just go into Minnesota and win. That those guys were going to lay down. It definitely showed us. It was kind of bittersweet at the same time. I think it was sad that we lost. And it was sweet that we lost at the end of the day because it helped humble us." Surrounded by reporters, Williams defended his remarks ... and then some. Much more on this in the print and online versions of The Daily Times. 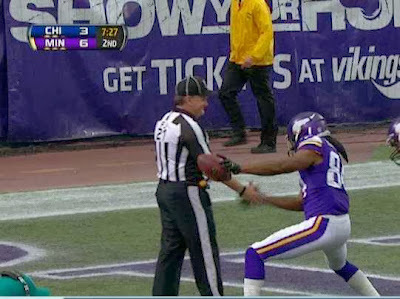 Think Cordarelle Patterson likes to celebrate with officials? Vikings running back Adrian Peterson will be held out of today's game with the Eagles according to a report from Sean Jenson of KTWIN. Peterson's backup, Toby Gerhart, also will be scratched per the report. Gerhart strained a hamstring last week. That makes Matt Asiata (5-11, 234) the starter. But the Eagles should be ready to defend rookie Corradelle Patterson as well. The game-breaking wide receiver/kick returner has five carries for 35 yards this season, including a 35-yard score two weeks ago. Patterson has sub 4.3 speed in the 40-yard dash. To paraphrase the old-timers, Patterson has two speeds ... here he comes and there he goes. Jeremy Bloom turned into a pretty compelling story when the Eagles selected him in the fifth round of the 2006 NFL Draft. Bloom was a better moguls skier than football player, but the Eagles rolled the dice that he could turn the page and help them at wide receiver and returning kicks. The experiment didn't last long. Bloom's 40-yard dash speed didn't translate to the NFL. Bloom is residing in New York City where his older daughter Molly recently pleaded guilty to some serious charges of running a high-stakes poker game with Hollywood celebrities and Wall Street big shots according to this piece. The Blooms' father, Larry, grew up in the area and is a 1965 graduate of Lower Merion High School according to reports.